Camden Catholic’s Julia Patrone (right), pictured in a game against Lenape last October, had a trick in Mondays 8-3 win against Cherokee. 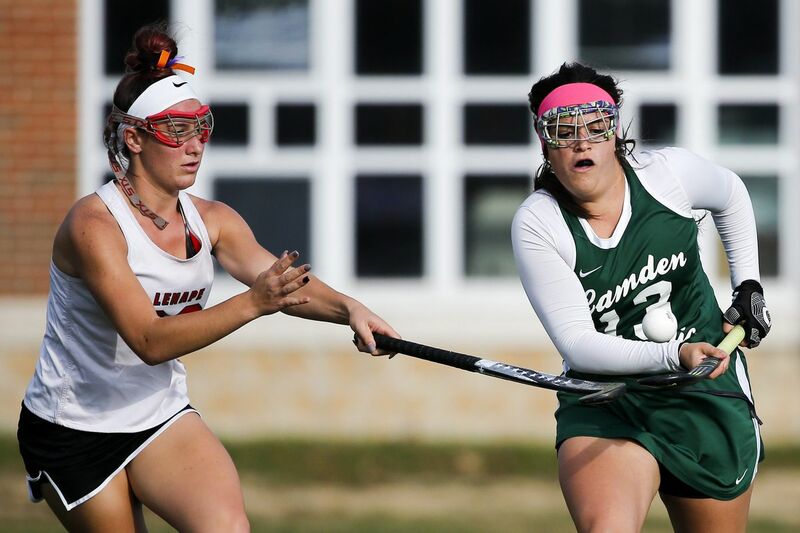 Julia Patrone notched a hat trick as the Camden Catholic field hockey team defeated Cherokee, 8-3, on Monday. Katherine Walsh added two goals, and Natalie Berry, Kaitlyn Cummins, and Jillian Orcutt chipped in one goal each. Katie Miller tallied three assists. Melissa Pallen's overtime goal gave Burlington Township a 4-3 victory over Cinnaminson. Macie Wernynski, Vanessa DiDonato, and Christyana Kane also scored. Burlington goalkeepers Haley Bucci and Jami Camm combined for 15 saves. Kylie Bresley scored three goals, and Caroline Barlow scored two goals as Lenape topped Cherry Hill West, 6-2. Megan McKenna also scored, and Lindsey Nanni tallied two assists. Marissa Rosario had a trick and Deja Harper added a goal to give Pemberton a 4-0 win over Medford Tech. Led by two goals each from Quinn Basewitz, Catie Wilson, and Amber Zelem, Collingswood topped Pitman, 7-0. Alexa Sherr also scored. Skyler Santucci scored a goal and Erica Solomen picked up an assist in Shawnee's 1-0 victory against Seneca. Goalkeeper Kiera Kennedy recorded six saves. Devon Purnell scored twice, and McKenna Mealey scored once as Gloucester Tech defeated Salem, 3-0. Hannah McKensie, Elizabeth Briles, and Rhian Freire scored in Cedar Creek's 3-0 win over St. Joseph. Ruby Anyanwu, Kayla Fisher, and Kiara Haywood tallied goals as Pennsauken defeated Delran, 3-0. Samantha Gurcsik scored four goals and added an assist in Collingswood's 5-2 win over Woodbury. Samantha Hamrick added one goal. Kat Soanes and Sophia Verrecchia scored twice as Bishop Eustace topped Timber Creek, 5-0. Sammie Sorensen added a goal, and Olivia Hansen chipped in two assists. Nellie Manalo-LaManna and Ava Racobaldo combined for nine saves. Nic Green's overtime goal gave Haddonfield a 1-0 victory against Haddon Township. New Egypt and Palmyra ended in a 1-1 draw after two overtimes. New Egypt's Nicole Winouski and Palmyra's Lily Beck scored the only goals. Mia Angelucci, Kelsey Clauss, and Alivia Gallardo tallied goals in Cherry Hill West's 3-1 win over Camden Catholic. Audrey Wendt scored off an assist from Amanda Attanasi as Washington Township took down Cherry Hill East, 1-0. Rancocas Valley topped Northern Burlington, 2-1, behind two goals from Alexis Linton. Goalkeeper Grace Walter saved 14 shots. Michelle Guapo had two goals and an assist as Maple Shade defeated Pemberton, 4-3, in overtime. Amber Hickey and Isabella Iervolino added goals for Maple Shade, and goalkeeper Marissa Lotierzo made 12 saves. Devin Sullivan and Bailey Swietanski scored two goals as West Deptford defeated Overbrook (N.J.), 8-0. Anna Brolly, Mel Hires, Anna Rossi, and Anna Wright added goals. Goalkeeper Deanna Corsetti made six saves. Abigail Maldonado and Damarisa Moore scored in Florence's 2-1 victory over Pennsauken. Samantha Cartier made four saves in goal. Cassie Reyes led Gloucester Tech with two goals in an 8-0 win over Salem. Payton Clements, Micaiah Croce, Gianna Fanfarillo, Alana Gvozdenovich, Adrianna Pepe, and Siearra Stichler also scored. Alyssa Carfagno and Natalie Schooley scored as Paul VI defeated Seneca, 2-0. Preston Beasley scored off an assist from Angelo Llerena as Atlantic County Tech topped Atlantic City, 1-0, in double overtime. Goalkeeper Luke Olley made seven saves, including a breakaway stop in the first overtime. Chad Yates tallied two goals and an assist to lead Washington Township to a 4-1 victory over Cherry Hill East. Alex Desiderio and Arturo Serano also scored. Jack Accorsi scored in the second half off a pass from Vincent Fedoryka to lead Clearview to a 1-0 win over Hammonton. Goalkeepers Eric Weiss and Zane Martin combined for the shutout. Eric Henshaw and Mitchell Hughes scored two goals as Medford Tech defeated Willingboro, 6-2. Daylan Garlic Jackson and Jordan Tracy added goals. Goalkeeper Owen Dobbins saved 14 shots. Patrick Sipera scored twice in Shawnee's 2-1 win over Lenape. Lindenwold defeated Audubon, 3-0, behind goals from Christian Bonilla, Ezequiel Estrada, and Brayan Sarmiento. Estrada and Jesus Llanes each added an assist. Goalkeeper Mayquin Reyes made four saves. Justin Giordano scored in the second half in Burlington Township's 1-0 victory over West Deptford. Luke Leach and Scott Spruill scored, and goalkeeper Jonah Mikulski made four saves as Seneca topped Paul VI, 2-0. Goals from Tiernan Johnson and Corey Taylor led Pemberton to a 2-1 win over Pennsauken.